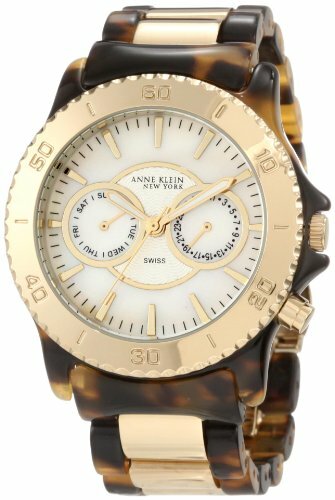 For a sophisticated look with dazzling details, this Anne Klein New York Women’s Tortoise Watch features a round, Mother-of-Pearl dial with bar-shaped hour indexes. It also offers gold-toned luminous, three-hand movement and an easy-to-read, printed minute track with day and date sub-dials. The gold-toned, metal bezel is engraved with Arabic numerals in ten minute intervals. A durable, mineral crystal window protects this glamorous dial from nicks or scratches. For an elegant look, the bracelet is designed with the classic link-style look and offers a sophisticated, tortoise pattern. The timepiece is equipped with reliable, Swiss quartz movement and is water-resistant to 99 feet (30 meters). 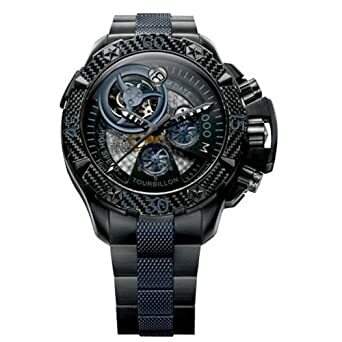 Black microblasted titanium case, Black titanium bracelet with blue lateral inserts, Deployant buckle, Unidirectional rotating black carbon fiber bezel, Screw down crown and push buttons, Black dial with silver carbon fiber in center, Luminous hands, Small seconds subdial, Chronograph feature (Seconds, Minutes, Hours), Magnified date at the 12 o’clock, Tourbillon visible at the 11 o’clock, Scratch resistant sapphire crystal, Automatic mechanical movement, Water resistant to 1000 meters/ 3330 feet. Shock and high pressure resistant. Limited Edition of 25 pieces.